Origin & Status: Indian subcontinent in Asia; endangered. 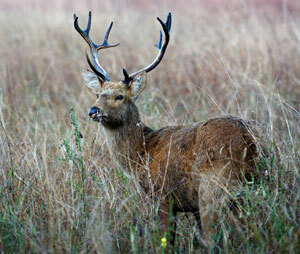 Texas has many barasingha. Description: Large, yellowish-brown deer often with hair tuft hanging from large ears. Traces of spots may persist into adulthood. Males grow C-shaped antlers with many points. Characteristic extra branching of mid tine, although not seen in all males. Each branch may divide again. Antlers for well-developed males average 30 to 35 inches long with 10 to 14 points. Clean velvet late August or September. Drop antlers in February. Male weight 370 to 400 lbs., and males maintain weight during rut. Females 300 lbs. and up. Food Habits: Live on grass. Relish grasses when green but eat many stout, course varieties and include much dry grass. Browse some in Texas (especially from oak). Habitat: Prefer a sedentary life in meadows with tall grass and water easily available. Exotics feed in grassy openings and shelter on oak motts. Water & Climate: Drink at least twice daily during hot season and irregularly the rest of the year. Wallow extensively during rut. Temperament & Compatibility: Docile. Serious fights uncommon. Not given to running in panic. Very gregarious but few social bonds. Generally compatible with common exotics. Special Considerations: Axis compete with barasinga for fresh grass. May quickly become undernourished if insufficient grass available. Feed grass hay in winter. Need brush for shelter from wind. Mineral supplement may help. In native habitat, determined to need about fifteen adult stags and twenty to twenty-five females for a vigorous rut, so may need about seventy total for a self-sustaining population. Same situation of exotic ranch, but experiences have varied elsewhere with lower totals still yield active breeding. Birth rate is low so take care to not disturb traditional rutting ground. Predators may be a major problem for young. Breeding Season: September to December or January. Birth Season: May to August.